For a while, Main Street Market in Topsfield had residents wondering if it would ever open, but it finally opened its doors last October, and we think it was worth the wait. Owner Terry Lee Carabillo closed the previous incarnation, New Meadows Market, in the fall of 2008 to develop the property and construct a new building for the market. The process took much longer than anticipated due to construction frustrations and setbacks, but that’s now ancient history. Main Street Market has an welcoming layout reminiscent of an old-fashioned general store, piled high with fresh local goods that read like a list of Dish favorites; milk and ice cream from Richardson’s Dairy, bread from A&J King, Taza chocolate, cookies from Lark Fine Foods, Grillo’s Pickles, Boxford Bakehouse granola, and Topsfield’s own Valley View goat cheese. Select meats, including grass-fed beef, and produce are also on hand in the cold cases. Toward the back is a counter that offers fresh brewed coffee drinks and teas, salads, and sandwiches made to order from 11:00 to 3:00 daily and ice cream by the scoop. Cookies, muffins, and other house made treats are available as well. Adjacent to the counter are beautiful stainless vats containing Ariston Select olive oil and balsamic vinegar. You can fill your own stoppered glass bottles and return for refills, which lightens the load on both your wallet and your recycling bin. The market also offers a terrific array of wine and craft beers. Thoughtful selections in a range of prices as well as beers from local brewers such as Ipswich, Cody, and Clown Shoes fill the shelves. 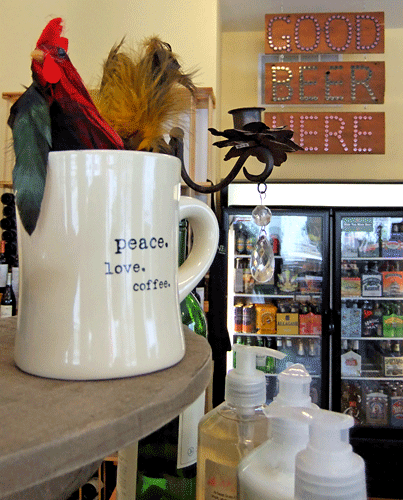 Next to the beer and wine, a fun aisle filled with funky gift items lends a festive feeling and rounds out the store. With inventory like this and genuinely helpful staff, Main Street Market is the sort of place we wish was our local corner market. Their website is minimal, but they do list daily specials and keep current information on their Facebook page. It’s a very unusual store – the only one of it’s kind in the area. 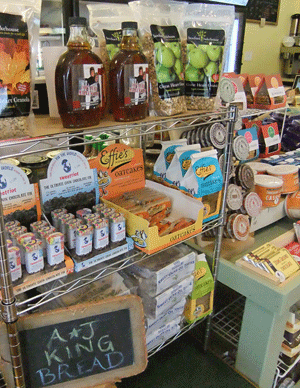 Killer beer and wine selection – and they have lots of knowledge about natural food products and grass fed beef. Super variety for anyone who wants to throw together s spectacular picnic or even get a basket of special/hard to find goodies together for someone else as a gift.